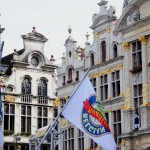 TheBrewSherpa is making arrangements to attend Belgian Beer Weekend in Brussels, Belgium. What better place to travel to imbibe some of the world’s best brews? The list of participants is formidable, and we are learning a little Dutch/Flemish in an effort to enjoy the beer and culture as much as possible. We plan on meeting our good friend Dirk in Brussels, who has offered to help us find our way to the holy grail of Trappist beers (wanna guess which one that is?)! More to follow! Posted on July 23, 2012 August 10, 2012 by thebrewsherpaPosted in Beer review, UncategorizedTagged belgian trappist brussels beer belgium.